Only three weeks have passed since I left Spain and I already feel nostalgic for the cries that echo off hill tops and the notes that weave through alleyways. I’m sitting at a cozy cafe tucked away on quiet Bainbridge Island where, apart from the fact that it’s a cafe, there is little here to remind me of Spain. A couple of older bearded men are picking guitars outside. They have a kind of folksy, blue-grass sound but a certain minor chord provokes a memory of last semester. The sound of Flamenco, even just one chord, sends my mind zooming back to Spain as fast as Jesse McCartney throws me back to middle school. I’ve never learned to play Flamenco but the chords are easy enough to recognize if you hear them daily for five months, which, in Granada, is hard to avoid. Whether background music in a cafe or performed live in a plaza, Flamenco permeates the streets of Andalucía. It echoes off hilltops and seeps through cracks in thousand-year-old buildings. There’s a fervor to it, which, to be quite honest, is so forceful that it kind of stresses me out. Flamenco is the antithesis to my quiet island cafe where I sip jasmine green tea and stare at a beige wall. Flamenco is never beige, I think. It must always be red. I saw my first Flamenco show on a program trip to Sevilla, one of the most important cities in the art’s development. One hundred and twenty of us crowded into a small theater for an intimate espectaculo (spectacle or show), where we were faced with a row of four empty wooden chairs. When the performers emerged I was struck by their informalities: smiles and laughs, a pat on the back. While one or two dancers stood, others remained seated, blurring the line between performer and spectator. Casual but energetic exchanges continued throughout the show with claps, stomps and yells of “¡Olé!” — a word that, despite its constant appearance on t-shirts and postcards, felt authentic in the moment. It was precisely this lack of formalities that made Flamenco so spectacular. The emotion was raw. My heart beat fast as my eyes fixated on the hands of the guitarist and the mesmerizing swirl of colorful skirts contrasted with the hard and fast stomp of black, shiny shoes. One woman danced so hard she launched her hairclip into the audience and a man spun so fast the sweat from his hair flew off and hit me in the face. This would have been gross if I wasn’t so impressed by the way his feet were moving faster than I could think. It didn’t matter that he left the stage to get water partway through the show: this just meant that there was no doubt he had given it his all. Flamenco builds up the way a good symphony does. The guitarist tiptoes across the neck of the guitar, playing so fast I have goose bumps and am on the edge of my seat, sweating. It’s suspenseful, sometimes ominous, and I almost jump when he breaks into a bold, loud strum. 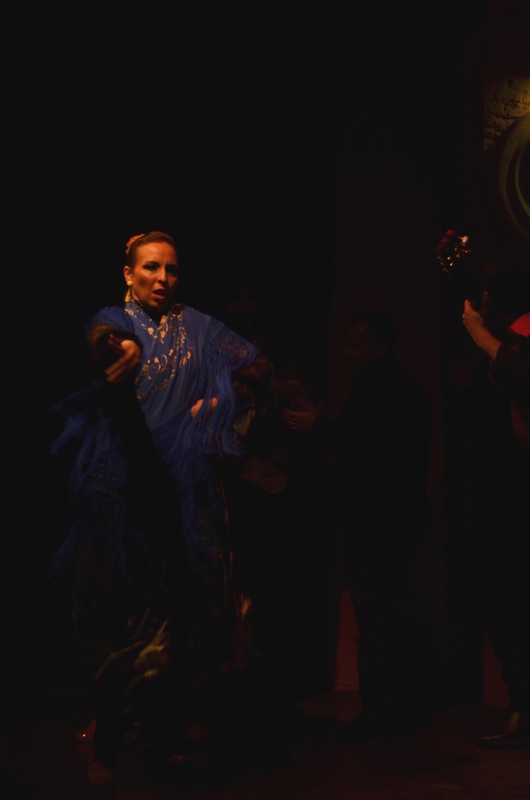 Flamenco is known for provoking this kind of emotion, channeling a power called duende. Before investigating Flamenco Tremlett claims he had never fully felt the emotion that the music is supposed to provoke, never sensed the famed duende. In fact, it isn’t until Tremlett attends a Flamenco competition in Granada’s jail° that he finally experiences the music’s true magic. Reading this made me wonder if what I had witnessed in Sevilla was particularly impressive Flamenco, or if my taste simply isn’t quite as refined as Tremlett’s. Given the knowledge of our program director, though, I am tempted to believe the former. While Wikipedia’s definition of Duende may serve as a jumping off point, it no where near conveys the full meaning of the word. In 1933, renowned Spanish poet and Granada native Federico García Lorca delivered a speech called “Play and Theory of Duende,” which is so artfully written that I’m almost afraid to discuss it. Duende, writes Lorca, is “the mysterious force that everyone feels and no philosopher has explained.”* Duende is what sends chills through our bodies, what makes us clench our fists and gasp, momentarily forgetting where we are, or how we got there. Lorca states that the artist must struggle with duende. It comes from deep within and “delights in struggling freely with the creator on the edge of the pit.” Being on the edge is important, as the concept of duende deals with moments of death and birth, and is thus best expressed through dance and song, where living creatures participate, “since they have forms that are born and die, perpetually, and raise their contours above the precise present.” Flamenco is a deep recognition of the danger and wonder of life. In order to truly grasp Lorca I would need to grapple with the text for much longer. Like Tremlett, Lorca mentions that many people who watch Flamenco, or another art for that matter, do not truly experience duende. According to Lorca, some artists deceive onlookers into believing they posses duende, when, in reality, this is only a facade. I’m still unsure of whether or not I witnessed duende during my time in Spain. A high school teacher once recounted the words of her dad to my graduating class: he claimed that the music of a violin is impossible to fully appreciate until one is older, that a certain sadness must be felt before some notes can be heard. I wonder if this applies to Flamenco. Could the sounds of Andalucía grow even richer later in life? I suppose I’ll have to return to find out. °For a number of years, a Flamenco competition existed between prisoners in various locations in Spain. Tremlett attended a final competition featuring performers from 12 prisons. The winner of the competition generally received a monetary award along with a recording contract. The first ever competition included an early exit from jail, amongst other prizes. This entry was posted in Uncategorized on June 30, 2017 by carleycc. I met Marta and Alex in a small drab café on a Wednesday night that might’ve been Valentine’s Day. We introduced ourselves and Marta told me she traveled the world selling meat. I said I was a vegetarian. We got along quite well. This was about my fourth time visiting the café: my roommate and I, along with a couple of friends, had become regulars. The drabness was kind of endearing, the food was decent and we liked chatting with the woman who worked there. It was usually empty, too. On this particular night the only other guests were Marta and Alex who struck up a conversation after correcting our Spanish when one of us made a mistake speaking to the waitress. Twenty minutes later we were deep into a somewhat silly and particularly loud debate about vegetarianism, which resulted in the waitress cranking up the volume of the soap opera that was playing in the background and Marta inviting us all to stay at her flat in Valencia for a festival known as Las Fallas. Given the frivolity of the evening I assumed the offer wasn’t serious – and then a few weeks later I received a message to confirm that I would be coming and bringing friends. 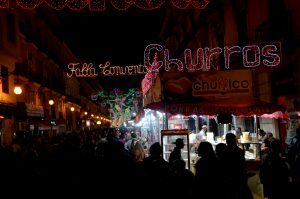 While I knew little about Valencia or the festival itself, I felt lucky to have been invited by locals and three of us decided we would go. On a sunny Friday morning my friends and I traveled five hours north east to the coastal city of Valencia, capital of the autonomous community that shares its name. As we neared the city the language of road signs changed to what might appear to a foreigner as a curious mix of Italian and French. While not technically part of Cataluña, the region’s neighbor, many Valencians speak a version of Catalan known as “Valenciano.” Some claim that this is a language of its own , but at least as I understand it, there is very little difference between Valenciano and its neighboring language. The question of whether a manner of speaking in Spain is a dialect or language tends to be rather politicized. 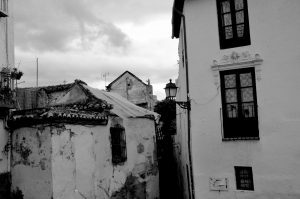 There’s no doubt that Euskara, spoken in the Basque Country, is a language of its own, with unknown roots or connections. Categorizing Valenciano and Gallego (from Galicia) tends to be controversial, though. While I won’t go into detail about the strong and complex regional identities of Spaniards, it’s worth mentioning that such loyalty to one’s home region exists, as it helps to explain Marta’s firm insistence on how much better the food in Valencia is than in Granada. 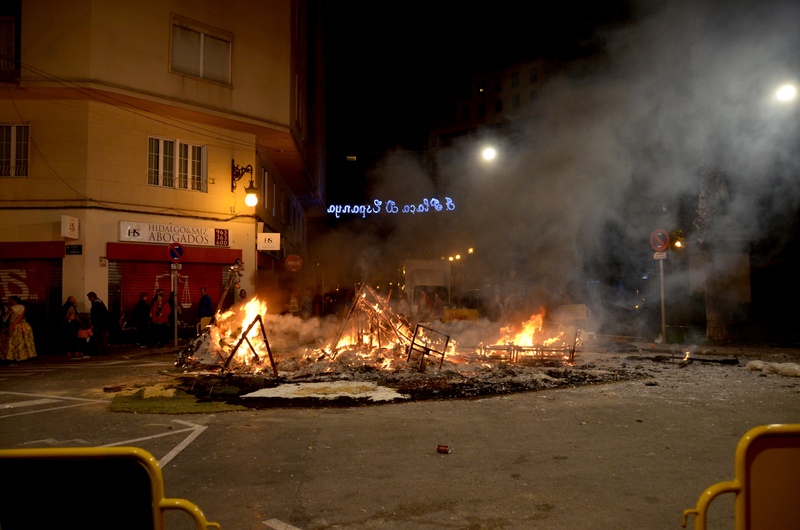 It also might help explain the answer I was given when I asked what “Las Fallas” celebrates. As it turns out, many cities, towns and churches in Spain have their own patron saints. 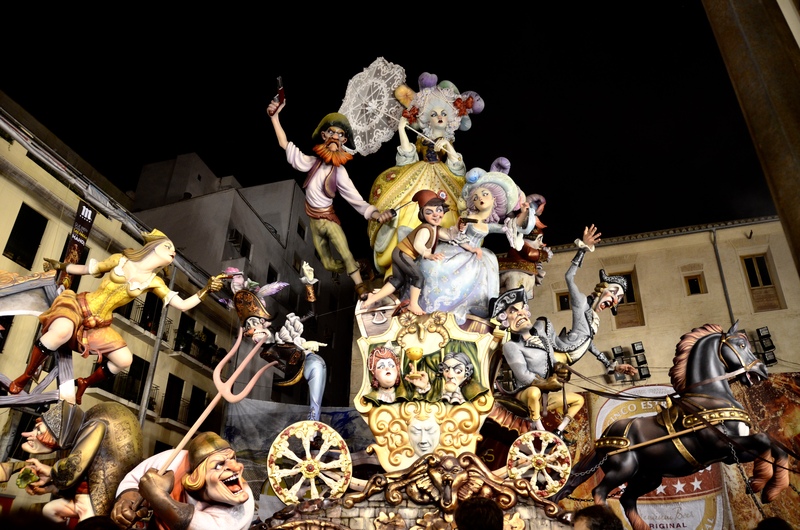 In Valencia, Las Fallas, in part, celebrates Saint Joseph, the patron saint of carpenters, by building 40 foot elaborate statues out of wood and polyester (the statues are called ‘Fallas’) and then proceeding to burn them down. This is somehow done in a controlled enough manner as to not char the entire city. The festival also involves an obscene amount of explosives and children wandering about with petardos, small (harmless?) fireworks. Marta’s mom, who was also staying at the flat for the festival, had a slightly more satisfactory answer for me. This is at least partially correct. 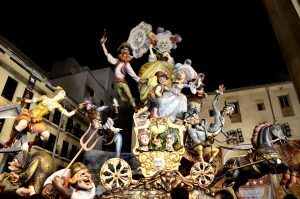 Las Fallas, as it turns out, began as a celebration of the coming of spring when local carpenters would burn old wood scraps along with the pieces of wood that were used to hold up candles illuminating their workshops during the dark winter months. They burned the scraps in celebration of Saint Joseph and as a kind of cleansing of unfavorable events of that year. Since then the festival has evolved dramatically. What began as a pile of scraps gradually grew more elaborate with each neighborhood in the city presenting their own Falla. Today the temporary monuments often take on a satirical character, mocking current events or politicians (Trump was a common feature). Growing in popularity in recent years, the festival was added to UNESCO’s list of “Intangible Cultural Heritage” in 2016. But I knew nothing of this history during my time in Valencia, which was mostly characterized by constant confusion and sensory overload. Arriving at the packed city center, most of what I felt was unprepared. Despite my best efforts at playing it cool (which really weren’t that impressive) I never quite adapted to the constant bang of fireworks. Breathing in the smells of Fourth of July and flinching at every opportunity, I gingerly followed the others to Marta’s flat. Spaniards are known for being noisy. This, in fact, was one of the first things we learned about Spain during orientation. I don’t mean that orientation was noisy. Rather, we were warned directly about the difference in noise levels between Spain and, well, a lot of other places. The constant bang of explosives (day and night) was not the only notable sound we heard while wandering the streets of Valencia. Reggaetón blared from temporary stages and dance floors and the occasional marching band squeezed through the crowd. And then, of course, there were the festival-goers themselves competing to be heard over the cacophony. We spent our first night in Valencia dining with Marta’s extended family, which filled the entirety of a small corner bar. The food was excellent and the laughter loud. When a rather pouty child wouldn’t lift his head off the table his parents gave him a small box of explosives and accompanied him outside. After we had finished eating and as the “sobremesa”* was winding down, we headed out to the streets for a bit of dancing in a nearby alley turned discoteca. Our crew was eclectic. Three guiris** looking surprised by everything we saw, and various members of Marta’s family ranging from 1 to around 50 years old. The baby spent the entire time in a stroller, awake but not crying, despite the noise. He had a look of indignation on his face (if babies are capable of that), as if thinking that all the people around him had completely lost their minds — which I couldn’t dispute. We danced for about an hour to Spanish songs that everyone seemed to know and I pretended to sing along to. The Valencianos laughed when I flinched involuntarily at nearby booms. I shouldn’t worry, they insisted, no one ever gets hurt at Las Fallas. We stayed up until 5 that night (not abnormal on a Spanish weekend) and awoke late the next day, immediately heading for the city center where “La Mascletà,” an insanely large firework show, would take place. It is important to note that we arrived two hours early in order to get a good spot to “watch” the fireworks. It should also be noted that arriving two hours early meant arriving at noon, meaning the fireworks would explode at 2:00 p.m., in broad daylight – sound was clearly prioritized over vision. Upon arriving at the center we ducked into a corner café to grab snacks and caffeine. 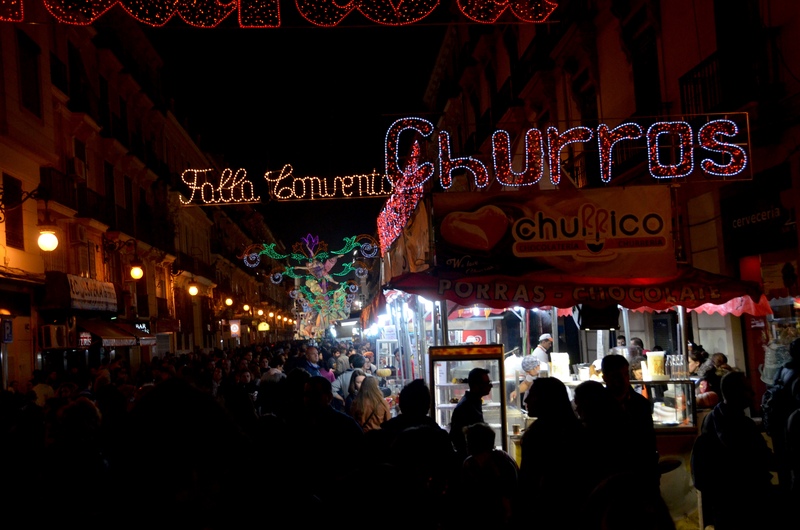 By the time the countdown to the Mascletà began there was no way out of the café. We made it about ten feet away from the exit before we were quite stuck. What happened next was perhaps one of my favorite moments from the weekend. While peering over the sea of heads that clogged the “Salida de Emergencia” I began to hear shushing. Clearly, a number of people in the mob that surrounded us were quite concerned about the full effect of the explosives being drowned out by excited voices. So for a brief moment, after counting down, the crowd was hushed — a grand feat for any group that size but especially in this context. All that was left was the quiet buzz of excitable whispers. Then the ground began to shake. The event lasted about five minutes, and while I couldn’t appreciate the physical appearance of the fireworks, the booms were perfectly timed – like a giant explosive marching band audible from miles away. At one point the crowd began to clap along. When all was done a giant gray cloud drifted over the city, darkening the sky. The magnitude was impressive – I wondered how much all those fireworks cost, I wondered if anyone was bothered by it. Then I learned that the Mascleta takes place not once during Las Fallas, but every day for the 19 days leading up to la Cremà – the burning of the statues. That afternoon we packed ourselves into a city bus to the beach. I had expected the center of Valencia to be situated closer to the water but the beach zone of the city felt sleepy. Side streets and neighborhoods still presented their Fallas but they were smaller, less impressive. Petardos still exploded along the cracked, sun-bleached streets, but with less frequency. At the beach we ate some renowned Valencian Paella before heading back to the city center to explore some of the Fallas. I was struck by the way most of the statues resembled one another in style. All bulging, colorful cartoon-like representations of historical, mythical or political figures, all to be burned down the next night. I was told that the Falleros (those in charge of designing and constructing the figures) often stood by crying as their year’s work caught fire sending a large black obnoxious-smelling cloud into the atmosphere. We wouldn’t witness la Cremà, though, as we had planned on returning to Granada the next morning. Or so we thought. 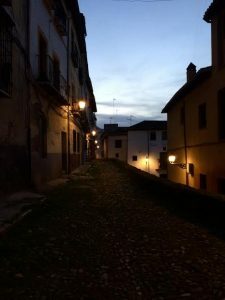 Our plan was to use BlaBlaCar*** to get back to Granada – we had a car booked for the three of us that would leave late morning on Sunday. We bid farewell and gave many thanks to Marta, Alex and their friends, then proceeded to wait for our car for over an hour. This was no one’s fault really, the car had broken down, and whatever word our driver used to describe this was one that we didn’t understand, resulting in exasperation and frustrated phone calls. By mid afternoon one of our crew was off to Granada in another car, and two of us would spend hours wandering to the bus station, train station and any café with Wi-Fi that wasn’t filled up to double its capacity. Eventually both my friends had rides home and I was left to spend the night again with Marta, Alex and Co. 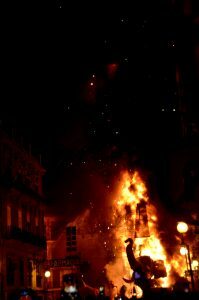 This also meant that I would witness la Cremà, which was quite unlike anything I had ever seen. The falla we decided to watch burn, one of the biggest in the city, was lit from the bottom. Bright flames shot upwards and danced around as the structure, as tall as the four story buildings on either side of it, began to turn black. Pieces began to detach and fall to the ground, somehow all within the designated safety area. 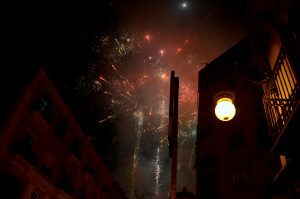 Dark clouds of funky smelling smoke curled in the sky and began to send small, floating, red-hot remnants of the Falla raining down on the crowd – which was when we decide to head out. The road home was lined with bittersweet scenes of burning embers. *I first encountered the term “sobremesa” (over the table) during my travels though Chile last summer. It refers to the period of time spent talking around the table after everyone has finished eating, which in Spain and Latin America tends to be much longer than in the United States. **A slang term Spaniards use to refer to foreigners. ***A ride sharing app, popular in several European countries. It functions a bit like Uber, but for longer distances. This entry was posted in Uncategorized on May 22, 2017 by carleycc. A curious thing happened yesterday. I was sitting in one of my favorite places in the Albaicín — a small courtyard with two benches and two purple flowering trees that smell a bit like lilac, though I’m not sure what they are. I came there to read, and brought along a guitar just in case I remembered how to play it. In the distance I could hear people laughing and talking on a terrace somewhere. A bit of a rowdy crew, they shouted shrilly over music from speakers. After a while, I began to pick out the sound of guitar strumming, and quickly recognized the tune. I don’t know the song’s name, but I knew I had heard it before. A couple of months ago I was in Bath, England with my mom. In one of the town’s main squares we encountered a street artist and chatted with him after he finished his first set. He told us he had been to Spain before, though not Granada. When we parted he said “encantada,” which is how Spaniards say “nice to meet you.” Accustomed to the Latin American “mucho gusto,” this was the first time I heard the Spanish phrase. Sitting in that courtyard I could have sworn that I heard one of his songs drifting toward me. I jumped up from my bench made my way up the hill. I stopped first at the terrace, where kids that looked about high school age crowded around speakers laughing and smoking. The smoke from the cigarettes danced in the sky, framing a view of the Alhambra, a Moorish fortress and UNESCO World Heritage Site over one thousand years old. I asked an older woman on a bench if she could hear the guitar and she pointed from where I had come. “La esquina [the corner],” she said with a sideways nod. I thanked her and she puffed her cigarette, staring blankly at the World Heritage Site in front of her the way a kid might stare at a convenience store through a car window while waiting for their parent to emerge. I hurried down the cobbled steps, guitar swinging at my side, feeling slightly cooler than normal since I had just purchased a new pair of sunglasses for eight euros. I was on a mission. Rounding the corner I came unto a small sunlit plaza where nicely dressed couples sipped wine in fold up chairs under balconies full of potted plants and strung with ivy. In front of an old church sat a man with a guitar and dreadlocks — not the one I was looking for. I approached him as his song ended and asked what it was called. He gave me a puzzled look. “It’s from my country,” he said. “Czechoslovakia.” We made small talk for a bit and I found out he’s lived here for a couple of years. I asked him what he does and he looked confused again, perhaps surprised that I was asking him if he had a more “regular” job. It turns out he’s been living in a cave in Sacromonte, the neighborhood just beside the Albaicín. Some Romani families have been living there for generations, but more recently the caves have become a popular spot for bohemian travelers. I explain my quest to him and ask him if he’s heard another guitar close by. He hasn’t, but as we chat the soothing notes of Simon and Garfunkel float by my ear, so I bid farewell to follow them. 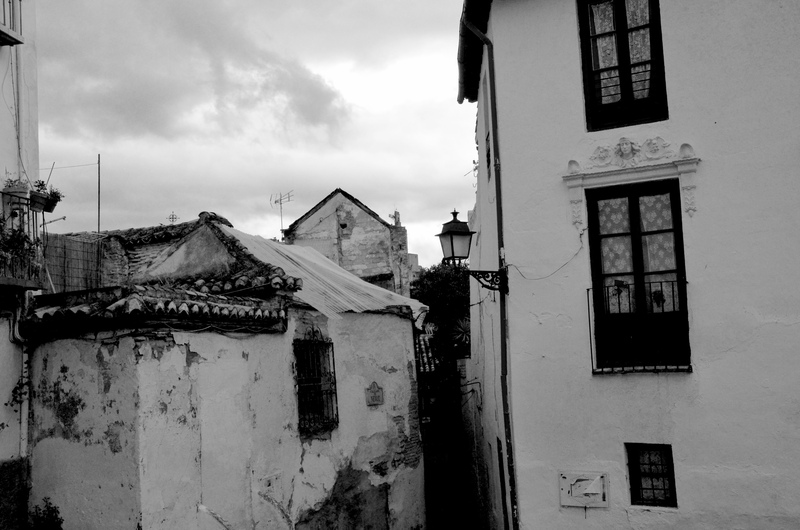 One of the first things that surprised me upon arriving in Granada was the way sound travels through the city. The tall looming buildings and thin winding alleyways were once meant to provide shade and confuse enemies. Today they produce echos, only audible at night, when less people are about. The diffusion of sound makes it so that turning a corner could transform a peaceful evening into a ruckus. 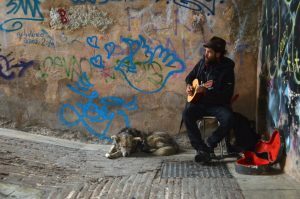 I wonder if such a quality works to the advantage of street musicians, who can choose virtually any corner of the Albaicín to claim for their own. Following the sounds of S&G I weaved down a thin alleyway to find a young man leaning against the wall playing a beautiful rendition of “Sounds of Silence.” He wasn’t the right one, but he had a similar style to the man from England, so I hung around until the song ended. “Excuse me,” I said in English, as that was the language he was singing in. “What was the song you were playing before this one?” He didn’t follow. “Mejor ingles o español?” I offered, thinking I would make sure this time. I don’t like to assume that people around me will speak English, but it’s often true. Many of the people I’ve met in Europe speak at least three languages, if not more. I have friends from Sweden and France who speak English quite well, but we always converse in Spanish. It feels better that way — the conversations are less lopsided when we walk on neutral ground. The man with the guitar said either language was fine with him, so I asked again in English. I explained my predicament, and we chatted a while. When he said he was from Venezuela I figured I’d switch back to Spanish. The conversation quickly became dry and my hope of finding my friend was beginning to dwindle. At this point, though, I thought I might as well keep moving upward. I walked past some foreign backpackers and a man playing a flute against an iron gate strung with flowers. A few more twists and turns and I had arrived at a large open plaza bordered by gardens. I chuckled when I saw it, because it was full of musicians of various types, and I knew I had entered a live-action game of Where’s Waldo. I weaved through a crowd of hippies with steel pans, xylophones and some long sticks filled with something that jingles. I peered around at the eclectic mix of young dreadlocked couples and middle-aged British tourists. In the center of the square women in baggy clothes twirled hula hoops around their arms and waists and the sun began to set over the Alhambra. Everything smelled like weed. I scanned the crowd with one last sliver of hope for my friend from Bath. My eyes locked on a guitar player with a hat. He looked up and saw me staring. A brit, but not the right one. When night began to fall I abandoned my quest. The passionate cries of flamenco singers and the sound of hands keeping time faded into the distance as I descended back into reality. On my way down the hill I made acquaintance with a British woman of about 50. She had a swagger in her step and a slur in her words. “I don’t play well,” I responded with a laugh. “I can tell from your energy… or something… you’re destined to be a musician,” she mused, squinting at me. “It’s magic up there,” she said, nodding at the hill. This entry was posted in Uncategorized on April 3, 2017 by carleycc.